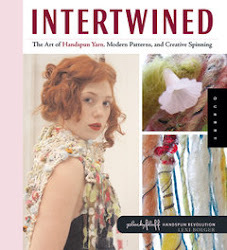 wooldancer: one moment in time..
Reading Intertwined, originally uploaded by kay be. to the spinstar pausing at this page, funny how i feel like i'm reading over your shoulder, sharing a moment together.. i could break into conversation about my collier right now! thanks for sharing this moment. 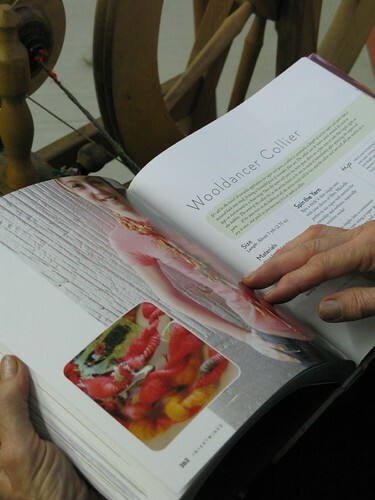 it's heartening to be reminded how honored i feel to be a small part of Lexi's amazing book.. i could just jump through the photo into the workshop room you are at & just hug her for adorning her pages with my work.. man.. sigh. thankful is one sweeet understatement. Looking at all the recent Camp Pluckyfluff flickr photos from Vancouver & Seattle, i feel the enormous gift Lexi has given all spinstars who have liberated their handspinning skillz via her generous spirit. I would love to one day attend a Camp Pluckyfluff so i can squoosh the mohairy outta her! They all looked like they were having fun (and then some) didn't they? I want to be a Camp Pluckyfluffer too! The woman reading the book was an amazing fiberista. She was retired and not plugged into a cyberfiber community so she just did what her whims and fancy dictated.